Mount Tamborine Vineyard & Winery feels like the tourist or visitor epicentre of Mt Tamborine. I don’t know why, but maybe it’s because of the size of the outdoor seating area; there’s more than enough to cater for a busload of hungry and thirsty people. Then there’s the adjoining cellar door that offers tastings of the vineyards white and red wines. That brings me to the eatery or kiosk where you need to go up to the counter to order and pay. There are plain and fruit scones, and I try the latter for the variety. 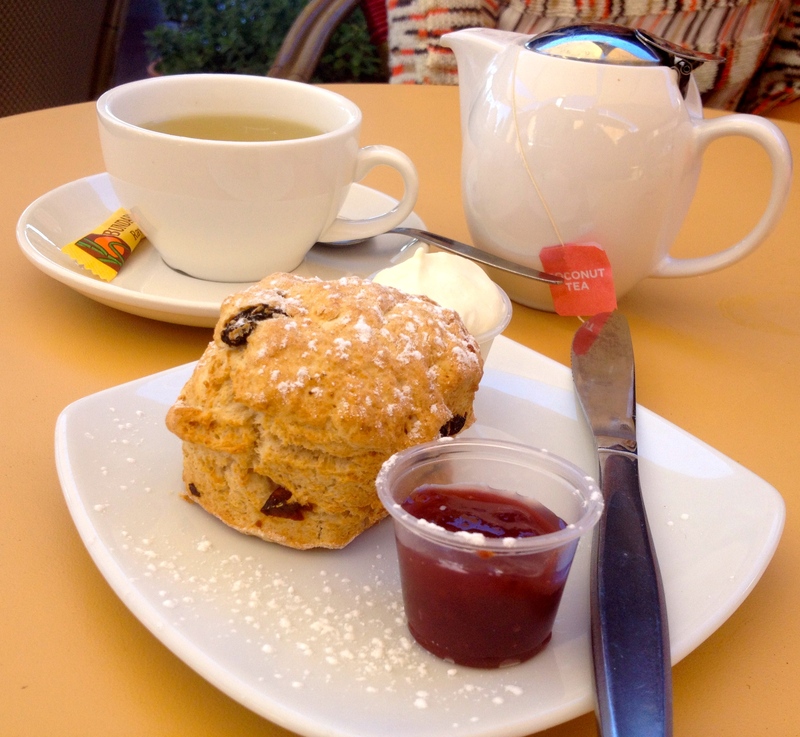 The scone is pretty tough and has a distinct cinnamon flavour that goes well with the fruit. Perhaps the plain scone is moist, but this late in the afternoon the fruit scone isn’t doing too well. The rhubarb jam is a treat, and an unusual choice of jam to serve with scones. My friend is not a fan of the thimble sized plastic container the jam is served in, saying it reminds her of receiving medication in hospital. The cream is served in the same type of plastic container as well and has potential, but has either melted or not been whipped enough. Tea: An impressive and unusual selection of loose-leaf and tea bag teas from Tea Tonic organic teas and other standard brands, served in a small teapot. Overall: Large and busy, it feels like the tourist hub of the mountain.